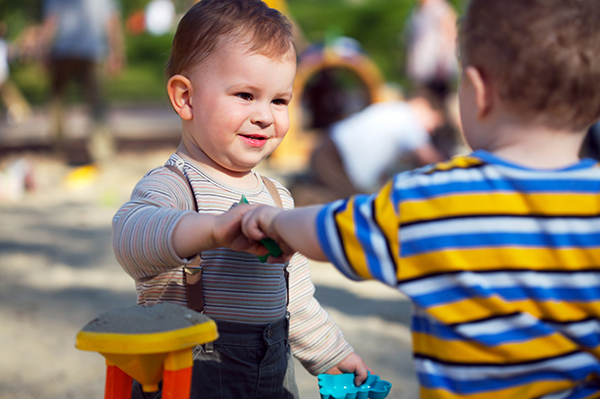 The preschool years are a time when young children begin to develop deeper friendships with peers. This is the age of the first “BFFs” (Best Friends Forever), when children gravitate toward peers who share similar interests or play styles. Preferences emerge within the preschool classroom, and jealousy may arise when a best buddy wants to play with someone else. Friendships are whimsical at this age. Best friends on Monday can be fighting mightily by Wednesday, then ready for a playdate with this same friend over the weekend. It is the age of “frenemies” and exclusionary play, when parents might hear common phrases like, “You can’t come to my birthday party,” a terrible fate for a 4-year old. As such, the preschool years are the ideal time to focus on developing and deepening social skills. Children need to learn to manage the big feelings that well up when navigating friendships, and they need specific conflict resolution strategies that encourage problem-solving and promote awareness of the experiences of others. To learn these skills, children need to practice … a lot. Parents and teachers need to provide play experiences in which children might struggle, and support them as they learn the tools to negotiate the difficult social situations that arise. Here are five tips for building and nurturing social skills in young children. Validate children’s feelings and experiences. “Something important is going on here,” is usually a nice entry into the world of children’s conflicts, because it assures them that you won’t minimize their struggle. Brainstorm some possible solutions, if needed. Begin with an open-ended prompt like, “Hmmm. I’m not sure how to solve this problem. What do you think?” The less competent you are, the more capable the children can become. It can be challenging to observe children struggle with friendships. As a caring, loving parent or teacher, we prefer that children don’t struggle or fight with their friends. The value of struggle, however, is that children learn to be persistent and resilient. Be a good listener, reflect and validate the experiences of your child, and prompt them to brainstorm when ready. In this way, we encourage children to build social skills that allow them to navigate the ups and downs of friendships, which, as we know, is a life-long journey. social skills or other challenges, please reach out to Parents Place. Heidi Emberling, MA, Parent Educator, Early Childhood Specialist, does individual consultations for families with young children, birth through elementary school. She also teaches workshops on a wide variety of topics, including managing challenging behaviors, positive discipline, toilet learning, sleeping issues, understanding temperament, social and emotional development, and sibling/peer relationships. Heidi also provides in-home and early education behavioral observations and teaches staff development workshops for early education professionals. Heidi has two Master’s Degrees: one from the University of California, Berkeley, and the other in Education, with an emphasis in Early Childhood Education, from San Francisco State University.